pointing their fingers to something I’m not. 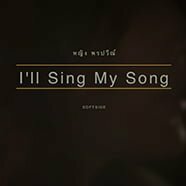 but I’ll sing my song. The song of my life, is not about me. It’s someone who cares, and he died for me. the road is dark, but I will be still. The battle’s not mine to fight. He is my saviour, he is my light. even when I’m all broken. no matter what I have done.